join us in revolutionizing Healthcare! In the changing Industry climate, the differentiation between a healthcare strategy and mobile healthcare strategy is dissolving. Hence, iPatientCare has developed mHealth apps to support patient-centric business models that focus on optimized clinical outcomes, value for money and patient satisfaction. These solutions are fully integrated and operable as part of a new mobile healthcare ecosystem. The miPatientCare (pronounced as “my Patient Care”, representing mobile EHR iPatientCare) EHR is an extension of our full-featured cloud-based EHR on iPad, and is meant to provide mobile healthcare providers with anywhere, anytime access to patient’s clinical records. Using this system you can view appointments, access clinical summary of patients and document the entire patient encounter while making hospital rounds or visiting hospice facilities. Our miPatientCare (mobile EHR) makes the digital dashboard available on your finger tips and allows you to stay connected with your office from wherever you are. All the refill requests, lab results, appointment list, messages are delivered in a secured manner and you can perform the necessary actions using a simple touch of a button. What’s more? It alerts you for all the new documents and tasks, even when you are not connected to the system. iPatientCare miPHR (pronounced as “my PHR” i.e. Personal Health Record”) is a scaled-down version of our full-featured Enterprise Patient Portal Software, and is meant to provide the patients with anywhere, anytime access to their own clinical records. It also allows them to communicate securely with the doctors' offices. This miPHR (Personal Health Record on iPad/iPhone) system allows the patients to view and maintain a complete clinical summary of their record, updated demographics, send appointment and refill requests, view lab/diagnostic test results and view personalized patient education material. The system also reminds patients for overdue medications and other health maintenance related activities. This is one of the great mHealth apps that will help you remain compliant with Patient Engagement related objectives under Meaningful Use Stage 2 and beyond. iPatientCare also offers Medication Adherence app and many more patient-centric tools. Click here to visit the AppStore and download these apps. iPatientCare contributes its share to the future wearable health technology with miGlass app. miGlass app on Google glass is a natural extension of iPatientCare’s well-designed web based EHR. It allow you to look at complete schedule for the day. On patient's arrival, it notifies you by posting a picture along with brief data from the patient’s chart. You can record notes and also take photos of injuries or videos of procedures. It allows hands-free access to patient information using voice commands and is extremely useful during surgeries. SmartWatches are composed to play an important role as wearable health technology in future medicine. Keeping this in mind, miWatch, iPatientCare’s SmartWatch based apps, are designed for both patients and physicians, giving them separate capabilities within the SmartWatches. Patients can use this smartwatch app to remind themselves of doctors’ appointments and set alerts and notifications from the patient portal. Doctors can use the app to remind themselves of appointments with patients, refill prescriptions, and read lab/test results and unread messages. 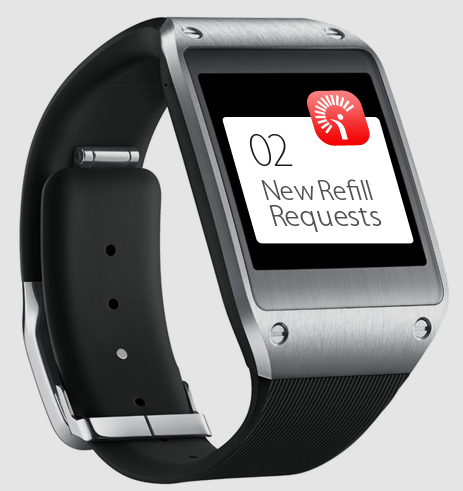 There are more functions for both kinds of users within this smartwatch app.